La Belle Assemblée, September 1807. 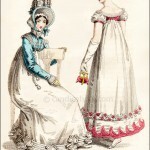 Though the title of the print says August 1807, the print was published in September. 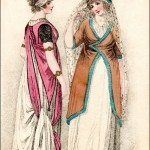 In these early years of La Belle Assemblée, they often showed an evening and day dress in the same print. It is interesting that the description here names the dress on the right as an Evening Walking Dress. I have not seen that designation in any other print. 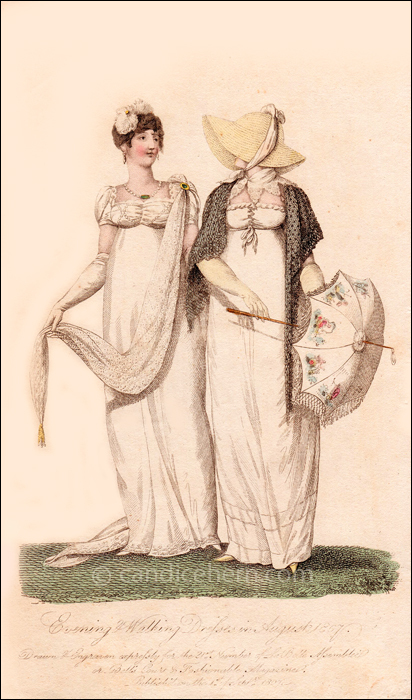 However, the bonnet and the parasol clearly establish the ensemble as day wear, so, perhaps the description is simply a mis-print. “No. 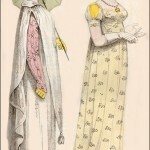 1.–EVENING DRESS. A round train dress of India muslin embroidered in a fancy border of needle-work at the feet. The stock bosom, ornamented with white beads. A full Spanish short sleeve, over a plain one of white satin. A scolloped lace tucker, placed strait round the borom. Circassian scarf of gold, chambrey, or lace, crossing the back and gathered in front of the left shoulder into an emerald brooch, reaching to the feet, finished with a gold tassel, and occasionally formed into drapery by the attitude of the right hand, The hair tastefully disposed in bands and curls; and a small ostrich feather crossing the crown towards the right side, is fastened to the hair with an emerald stud. Earrings, necklace, and bracelets of pearl, with emerald clasps. White kid gloves and shoes.